AP Inter Results 2019 | BIE AP Inter 1st, 2nd Year Results 2019 at bieap.gov.in apbie.apcfss.in/studentServices.do AP Inter 1st, 2nd Year Results 2019 | Andhra Pradesh Inter Results at bieap.gov.in. 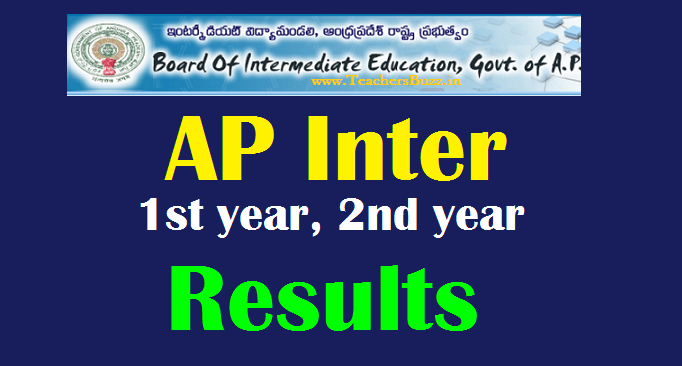 AP Inter Results 2019| BIE AP Inter 1st, 2nd Year Results 2019 at http://bieap.cgg.gov.in/, AP Inter 1st, 2nd Year Results 2019 , BIE AP 1st, 2nd Year Intermediate Results 2019, Download AP Inter Resuts2019, Check AP Inter Results at Board of Intermediate Education, Hyderabad official website,Get AP Inter Results 2019, Board of Intermediate Education, Andhra Pradesh, Amaravathi Inter Resuts, BIE AP Inter Results 2019, Inter First (1st) Year March 2019 Results, Inter Second(2nd) Year March 2019 Results, BIE AP Inter First Year and Second Year March 2019 Results, Board of Intermediate First Year and Second Year March 2019 Results. ★ ఇంటర్మీడియెట్‌ పరీక్ష ఫలితాలు శుక్రవారం విడుదల. ★ ఇంటర్‌ మొదటి, ద్వితీయ సంవత్సరం పరీక్షల ఫలితాలను ఇంటర్మీడియెట్‌ బోర్డు కార్యదర్శి బి.ఉదయలక్ష్మి ఫలితాలను విడుదల చేశారు. ★ సెంకడియర్‌లో 72 శాతం మంది ఉత్తీర్ణులయ్యారు. ★ ఈసారి కూడా అమ్మాయిలే ముందంజలో నిలిచారు. ★ 75 శాతం మంది బాలికలు, 68 శాతం బాలురు ఉత్తీర్ణత సాధించారు. ★ 81 శాతం ఉత్తీర్ణతో కృష్ణా జిల్లా అగ్రస్థానంలో నిలిచింది. ★ 76 శాతంతో చిత్తూరు రెండో స్థానం దక్కించుకుంది. ★ నెల్లూరు, పశ్చిమగోదావరి, గుంటూరు(74 శాతం) సంయుక్తంగా మూడో స్థానంలో ఉన్నాయి. Andhra Pradesh Board of Intermediate Education March - 2019 Results:The Board of Intermediate Education, Andhra Pradesh Intermediate Public theory Examinations was held from 27 Feb 2019 to 17th March 2019 and Second year exams was held from 28 Feb 2019 to 18th March 2019 from 9 am to 12 Noon. all these examinations were conducted successfully by the Board of Intermediate Education,Andhra Pradesh. After completion of spot evaluation of Intermediate examinations the 1st year and 2nd year inter results will be released. Students can check their ts inter results at bieap.gov.in. The Board of Intermediate Education (BIE) of Andhra Pradesh will announce the results of AP Inter 1st Year and 2nd year inter results in third week of April 2019 These results will be released by the BIE officials and results will be uploaded on its official website bieap.gov.in Students can check their results from official webportal. AP Inter 1st year march 2019 Exams Result Release Date? According to the most recent news from BIE, AP first year inter results march 2019 are going to be declared presently, in line with the annual schedule of the BIE AP board. Candidates can get their AP Intermediate 1st year Exam Results 2019 online. The AP Inter First Year Exam Results 2019 for session 2018-19 will be published at the website bieap.gov.in. AP 1st Year General/ Vocational final Results will also be Publish and Sent to respective Colleges. Therefore, all the candidates who did not got passed the AP 1st year exams can be appeared for Improvement/ Betterment/ Supplementary exams. So Check out AP Inter 1st Year Results 2019 from here. Andhrapradesh Inter board will release intermediate 1st year results 2019 in the second week of April 2019. The exact date will be publish soon after the confirmation from the board. AP Inter 2nd year March 2019 Exams Result Declaration Date ? Andhra Pradesh Inter Second year Results 2019 release date will be announced by BIE AP board will release AP intermediate 2nd year results 2019 in the last week of April 2019. The exact date will be publish soon after the confirmation from the board. The results will be officially announced by the Board of Intermediate Education Andhra Pradesh State. Once after releasing the results all the students can check their results. The results will also be updated in the third party results sites like schools9.com , manabadi.co.in, namasthetelangana.com, eenadu.net...We shall get back to you when the results are released. Keep visiting our site regularly for official updates. Candidates can get download their TS Intermediate 2nd year results 2019 from official website or Manabadi, Schools9, indiaresults.com, results.cgg.gov.in . 4. Click on Get AP Inter First /second year Results 2019 button. 6. Download and take the print out of results sheet. Results: TS Inter 1st year, 2nd Year Results 2019 Download. How to Get AP Inter Results 2019 through SMS???? Andhra Pradesh Intermediate Public Examinations Iyear , II Year (General) 2019 Results: AP Inter 1st, 2nd Year Results, results.cgg.gov.in, Results available Sakhsi Education, Eenadu.net , BIE Andhra Pradesh 2nd Year Inter Results 2019, AP Senior Inter Results at bieap.gov.in, Inter Second Year Results-2019, Inter 2nd Year AP Results, AP Inter 1st and 2nd year Results, AP IPE 2019 Results,Andhra Pradesh Intermediate exams 2019: Results for 1st, 2nd year to be declared on April 13, intermediate result, manabadi, bieap.gov.in, 10th result, ap inter result, bieap, manabadi.com, ap results 2019, ap inter results, intermediate results 2019, inter first year result, ap inter results, intermediate results 2019 ap, ap intermediate results 2019 declared, ap intermediate 1st year results, ap intermediate 2nd year results, www.bieap.gov.in.